A second. Isn’t it difficult to rise above the interruption, even when the event is short-lived? Yes! 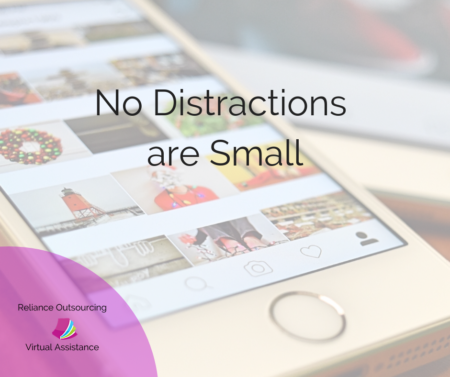 I find this especially challenging as a freelancer, to be in the midst of focusing on a task when I hear the ping of an instant message. When I stop to read the message, even if the stop is only for a few minutes of time, it requires a much longer time to get back into the grove of what I was working on. I do not yet know what the answer is, unless we could invent (ready for the next million dollar invention?) a mode of instant connection that came with the audible option of “don’t worry about responding to me right away”. Email? Email comes with a lesser sense of urgency. I’ve read comments and articles that email is going out of style, especially with the younger generations, but seriously, instant connection creates ripples in our day, and the old dinosaur – email – contains messages that we don’t read as soon as they pop in. We might peruse our email basket once or twice a day, no more than 3-4 (and that’s too much for productivity). This post isn’t a complaint. This post is pointed towards a, “What do we do?” question. The best choice, in my estimation, is to communicate our needs to others. Ask clients, and clients ask contractors, how do you want to be reached? What is your preferred form of communication when it is not an emergency? So, as I map out my to-do list, and when I focus in on what is most important to complete that day in order to reach my goals, I also need to include time for interruption. Of course! We wouldn’t be in business if we weren’t being interrupted at some point, right? But, what is the solution to staying on track despite being pulled way? Again, I believe it is communication. I also believe it is collaboration – an agreement of sorts between client/contractor/employee, and this is a part of working as a team, especially when remote team members are part of the picture. Last, but not least, be prepared to create a landmark. I worked for a refrigeration service company in Central Texas. From May through late September, we were inundated. As the full-charge bookkeeper, my office was my territory, yet, when people lined up at the customer service desk, or when the phones rang off the hook, I knew when to set everything down and jump out to help. What I learned was how to landmark. I wrote down where I was in my task, and I carefully took a moment to do so. I responded to the customer right away, but politely said, “I will be with you in one moment.” Customers appreciate knowing that you care about your work, and they love the full service and attention they receive once you’ve cleared your mind for them. Always make the “one moment” a quick moment though! How do you handle interruptions? How do you bookmark your thoughts when you are interrupted?